I am in several wedding planner-only Facebook groups and I find them all so interesting because of the diversity in opinions and methods. This blog post was actually sparked by a post today that I read. Essentially, a planner posed a question to the group: one of her brides was insisting that she gain editing access to her timeline. This planner does not allow editing access to her clients and was asking for advice on how to say this to her client in a nice way. The comments surprised me on the post, only because so many other planners have this same method of not granting any type of editing access to their timelines either. 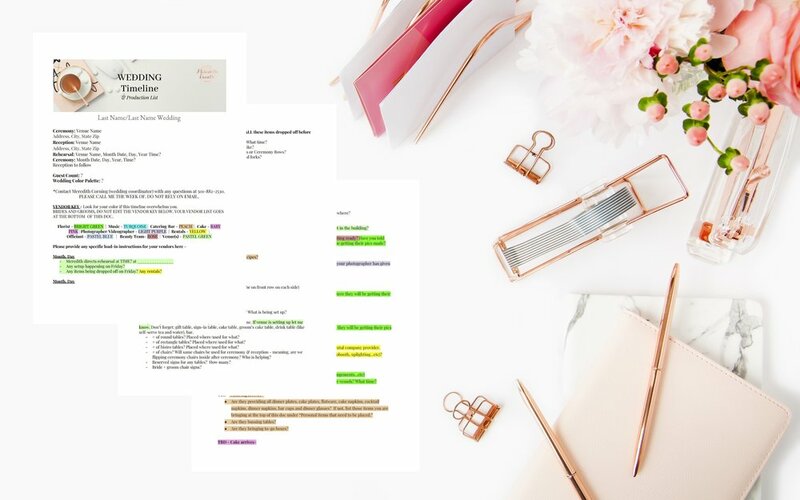 Basically, each planner had their own reasons for wanting sole control of what is added to, changed, or deleted from each of their clients’ wedding day timelines. I should note, this particular planner uses a software program called Aisle Planner, so maybe that has something to do with their method of not allowing access. Here was my response, below. Note: I am not posting the full thread to respect the privacy of other planners in this closed group. Since a lot planners have different processes for literally EVERYTHING, including timeline creation, I thought I would walk you through mine and how I got to this place. Let’s start with the fact that I do not use software programs like Aisle Planner, Dubsado, Timeline Genius or any of the dozens of programs available for planners’ workflow/client management. The main reason for this is because I like my curated organizational methods more! I have tried out free 30-day trials on several of these programs and each one is lacking on certain things that I would need and have to create separately anyway. Theses programs are not cheap either and I really try to minimize the amount of overhead I have to keep my package pricing as cost-effective as possible. Now, I will explain where I started in the timeline creation process and how I got to the methods that I use. When I first began my wedding business, like most newbie planners, I started out offering day-of coordination only at a ridiculously low price to get my feet wet. Because of the fact that I was very new coupled with the low price point, I did ask my clients to create their own timelines and send them to me completed two weeks before the wedding. I had a Dropbox folder I shared with each client that had samples and real examples of timelines that they could use as a reference..
What this did do was give me wonderful examples of how different timeline methods work from a variety of different clients’ perspectives. I also learned very quickly that I needed my own timeline template for my clients to fill out because often there were really pertinent details that were left off of a client-created timeline. A little tidbit about my clients: Obviously, this does not apply to every single client that hires me, but I would say the vast majority are what you would call “Type-A” personalities and want to be hands-on with the planning process. Therefore, I have curated my processes to accommodate my clients. Additionally, I do believe this streamlines the process and my clients love to have access to the timeline document. There are certain details that as a planner I cannot answer anyway, such as wedding party names and the order in which the client would like them to walk down the aisle or what personal items have been purchased for the wedding and where the client would like them placed. My job is to initially see what the client would like to have happen throughout the day then come in and troubleshoot, make suggestions and finalize those details in a logistically sound way. Not that there is ANYTHING wrong with the way other planners conceptualize their process, but this is the tried and true that works for me. First few years of business - Client would create their own timeline. This gave me great examples of what worked and what did not. Eventually, I created a timeline template via Google Docs that I could share with the client. I used different samples online that I had found over the years plus my previous clients’ own timelines. I pulled the pieces that I liked and discarded the ones I did not. Over the years, this timeline template morphed as I completed more weddings. If something came up during a wedding that I felt could have been avoided by having it on the timeline, then I would come back after that wedding and add a new question or bullet point. It could literally be something as simple as, a guest asked me what each layer of cake flavor was and I did not know. So this becomes a new question on the timeline template that I can refer to if I am asked that from now on. Fast-forward a couple years later and the template has become increasingly complex and intense. After receiving several phone calls from vendors after I had emailed the timeline to them saying, “I have a question and was going to refer to your timeline, but then I saw it was like 15-pages long and decided I would just call you instead,” I knew I had to streamline the document to make it easy for everyone to read or quickly reference. The document was re-organized and color-coded according to each vendor. I created a Vendor Key at the top, so that if you are the florist, for example, you will see in the Vendor Key that your bits are all highlighted in green. Now, each vendor can quickly scope out the information that pertains to them by seeking their personalized highlighted color. One great feature of Google Docs is that every time I login to the document, I get a notification if something has been edited. This seemed to be a concern in that Facebook thread I talked about earlier. What if the client deletes something on the timeline and I do not notice it? Well, in Google Docs this is not an issue because I see everything that has been edited on that doc including any deletions. Approximately two weeks before the wedding, I ask the client to please have as much of the timeline filled out as possible. The timeline essentially is a series of questions and pretty self-explanatory. We have a conference call two weeks before the wedding where we will walk through the document line by line. At that time, I can make any necessary changes, suggestions, edits and finalize for the vendor email list to send out. This call generally takes about one hour. Don’t get me wrong, some wedding timelines may take me a little longer to finalize than others, but all in all I have found this to be the most seamless way to handle the timeline curation. It gives the client an opportunity to voice what THEY want. It also serves as a final checklist and makes the client feel so much better about the organization of the day. This process empowers the client - at the end of the day, that is always my goal.